Technological advances have always come at a price. Since the beginning of civilization, people have found themselves displaced by the advent of new technology, whether they be the victims of the first battle fought with gunpowder in 919 A.D., or bank tellers being displaced by the ATM throughout the Eighties and Nineties. At the beginning of the twentieth century, a technological revolution was underway in the American entertainment industry, with legitimate theatre being rapidly eclipsed by the fledgling motion picture industry and the new invention of radio. By the close of the Twenties, a large number of legitimate theatres had been converted to movie houses in order to satiate the public appetite for movies. This sounded the death knell for many of the large touring companies, who were already under pressure from the increased costs of railroad travel since the 1910s. As a result, a large number of industry professionals found themselves obsolete, as Hollywood stars now caught the public eye, the recorded music in films negated the need for having full orchestras on hand, and projectionists supplanted the throng of stagehands and stage mechanics employed nationwide. With the onset of the Great Depression in 1929, conditions in the theatrical industry only worsened as economic turmoil tightened its grip on the country. In the New York City area alone, almost 98% of the legitimate theatres closed their doors during the 1931-1932 season. Though some private organizations were able to assist the large number of displaced theatrical professionals, such as the Actors' Fund and the Stage Relief Fund, the downturn in the industry was too widespread and too prolonged for them to cope effectively. Thus, the Works Progress Administration (WPA) Federal Theatre Project (FTP) was born, established by the administration of President Franklin Delano Roosevelt in 1935. As part of a large umbrella of government-sponsored public works projects aimed at getting Americans back to work, the FTP was aimed at re-employing the numerous theatrical industry workers on the public relief rolls through the production of theatre events around the country. However, a secondary objective of the program was to re-instate legitimate theatre as a vital element of community life, such that it would prosper long after the Depression and the FTP was gone. Unfortunately, because the FTP was a federally-sponsored program, the government could dictate what its audiences could see, which ultimately led to what has been called one of the defining moments in Twentieth century American theatre. For the first time in American history, the government has sent armed guards to prevent the performance of a play! This is the setting of "Cradle Will Rock", a 'mostly true' ensemble drama about how one of the plays produced by the FTP led to a firestorm of controversy on Capitol Hill and ultimately led to the cancellation of funding for the program. Hank Azaria ("Mystery Men") plays Marc Bliztstein, a playwright who pens a socially-conscious pro-union musical called "Cradle Will Rock", which depicts a strike in the fictional Steeltown. You have written something groundbreaking... never before has an American musical dealt with social issues like this. On the strength of its insight and socially relevant themes, the musical is put on the production slate by FTP director Hallie Flannagan (Cherry Jones of "The Horse Whisperer"), who attaches megalomanical director Orson Welles (Angus MacFadyen of "Braveheart") and producer John Houseman (Cary Elwes of "Liar Liar") to the production. As production ramps up, a number of rookie actors are signed on to play the lead roles, including Olive Stanton (Emily Watson of "Hilary and Jackie"), a young woman living on the streets selling songs for a nickel, and Aldo Silvano (John Turturro of "Summer of Sam"), an Italian immigrant with acting aspirations and a family to feed. Unfortunately, the play's political content soon puts the entire FTP under the scrutiny of U.S. Congressman William Dies (Harris Yulin of "Murder at 1600"), who believes the FTP to be a harbor for subversive elements and un-American activities. This ultimately leads to the doors of the theatre being locked and blocked by armed military personnel on the day of the play's premiere. The film also depicts events on 'the other side of the fence', where the custodians of big business are gripped in a state of anti-communist paranoia stemming from both the labor unrest within the country and revolutionary change in Europe. Steel tycoon Gray Mathers (Philip Baker Hall of "Magnolia") and newspaper magnate William Randolph Hearst (John Carpenter, the director of "Halloween") strike up a deal to covertly finance the Italian fascist effort against the spread of communism. Using Mussolini's ex-mistress (Susan Sarandon of "Stepmom") as a go-between, they secretly purchase Renaissance paintings from the Italian dictator. Meanwhile, Nelson Rockefeller (John Cusack of "Being John Malkovich") commissions Mexican communist painter Diego Rivera (Ruben Blades, who recently ran for President of Panama) to paint a mural in the lobby of the Rockefeller Center-- a mural which will eventually be destroyed by sledgehammers due to the inclusion of a portrait of Lenin. Finally, there's the story of former Vaudeville ventriloquist Tommy Crickshaw (Bill Murray of "Rushmore"), whose misdirected romantic pursuit of politically minded WPA clerk Hazel Huffman (Joan Cusack, heard recently in "Toy Story 2") leads to a betrayal of everything he once stood for. When did you stop supporting art? I supported your art, but that does not mean that I must support your revolution! 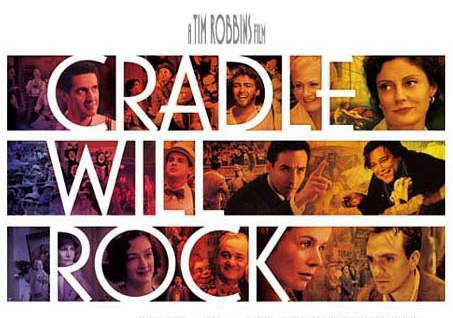 "Cradle Will Rock" is writer/director Tim Robbins' (last seen in "Arlington Road") third film, and like his "Bob Roberts" and "Dead Man Walking", it is a socially-conscious drama that aims to provide perspective to a challenging issue. This time around, Robbin's juggles a number of interesting ideas, from freedom of expression (if the government funds a work of art and cease funding due to the content being disagreeable, is it exercising right of ownership or is it censorship? ), the prostitution of the artist (a number of characters are faced with a dilemma between their values and their obligations), and how anti-communist fears created an ideal environment for the spread of fascism. Our union has forbidden us from performing in that show... if we even go to that theatre we could lose our jobs. Unfortunately, Robbins ambitious effort leaves too many balls up in the air at one time, and the result is a muddled film with far too many characters and not enough focus to engage the audience. For the bulk of its running time, Robbins throws snippets of dialogue, running gags, and plot information at a breathtaking pace as the story whizzes through the four main subplots, and after awhile it begins to feel gimmicky (particularly the magic realism that Azaria's character is subject to). 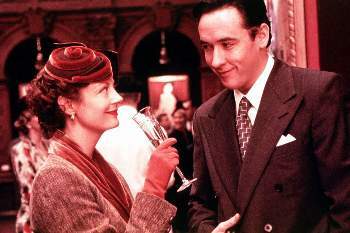 Aside from the scenes centering on Watson and Turturro's characters, the film gives the audience few emotional hooks to latch onto, leaving a jumble of archetypal characters to muddle through some quirky situations (such as Vanessa Redgrave playing a Countess who feels invigorated by being subversive) that never amount to much. 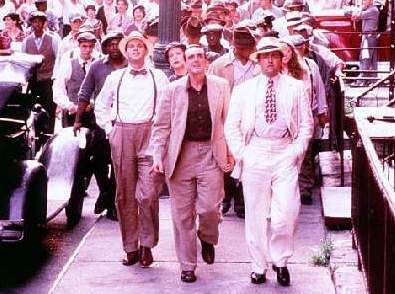 For example, in the film's pivotal moment, when "Cradle Will Rock" is actually performed in defiance of a court order, only a smattering of highlights of the musical are shown, vastly diminishing the emotional and thematic resonance of what is arguably the film's strongest scene. And though Murray does a memorable performance as a disillusioned vaudeville performer, particularly a priceless scene where he must train two no-talent hacks the art of ventriloquism, the subplot of his character could have easily been dropped in favor of tightening up the story. As alluded to earlier, the film's best performances come from Watson and Turturro. Watson is quite affecting as a homeless woman who only wants to sing, and Turturro does a terrific Pacino-esque 'performance' on stage in the film's finale. Another noteworthy performance comes courtesy of Cherry Jones, whose portrayal of the smart and sassy FTP director adds some spark to the film's otherwise sagging second act. And though the rest of the cast is quite good, their talent ends up being wasted with playing one-note characters (such as MacFadyen and Elwes' imitations of Welles and Houseman). Without the sardonic edge of "Bob Roberts" or the emotional wallop of "Dead Man Walking", "Cradle Will Rock" is an ambitious effort with good intentions mired by poor execution. Though the film does have its moments, it is difficult to sit through given its meandering script, obsession with one-joke characters, and inability to come together into a satisfying whole. In light of the season's other ensemble drama "Magnolia", "Cradle Will Rock" is amateur night.